White's second son, Peregrine White, was born on the Mayflower, while it was anchored at Cape Cod. He was the first English child born in Plymouth Colony. White and his servants, Holbeck and Thompson died soon after landing, in early 1621. White's widow, Susanna, married Edward Winslow in May 1621, which made her the first Plymouth Colony bride. Winslow had also been a Mayflower passenger and later became the second governor of Plymouth Colony. :101 Together they had five children. She and Winslow are buried in the Winslow Cemetery. Resolved White married Judith Vassall, the daughter of William Vassall. Peregrine White married Sarah Bassett, daughter of William Bassett. ↑ 1.0 1.1 1.2 Bradford, William (1856). History of Plymouth Plantation by William Bradford, the second Governor of Plymouth. Boston. 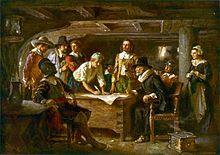 ↑ 2.0 2.1 George Ernest Bowman, The Mayflower Compact and its signers (Boston: Massachusetts Society of Mayflower Descendants, 1920). Photocopies of the 1622, 1646 and 1669 versions of the document pp. 7-19. ↑ 3.0 3.1 Stratton, Eugene Aubrey (1986). Plymouth Colony: Its history and people, 1620-1691. Salt Lake City: Ancestry Publishing. ISBN 0-966489-18-3 Check |isbn= value: checksum (help). ↑ "Edward Winslow". Pilgrim Village Families Sketch. 2013. Retrieved 18 June 2013. ↑ "Susanna White Winslow (1595 - unknown ) -". Find A Grave Memorial. 2013. Retrieved 18 June 2013. This page was last changed on 11 July 2018, at 17:57.